All of the city’s 30,800 parking meters are being equipped with NFC stickers that allow drivers to pay for parking with their NFC phones, get a reminder when their parking time runs out and add extra parking time wherever they are. The San Francisco Municipal Transportation Agency (SFMTA) has begun adding NFC stickers to the city’s 30,800 parking meters, giving NFC phone users the option to pay for parking with their handset. Deployment has already been completed in the city’s Castro district and will be extended citywide as installation of the stickers is completed. 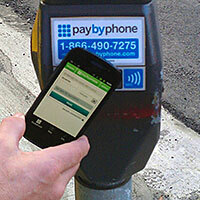 SFMTA has picked parking solutions specialist PayByPhone to supply the NFC parking system. Each sticker contains an NFC tag that stores the number of the parking space. Drivers with NFC phones simply tap the sticker on the parking meter to automatically launch a parking application. The driver then enters the amount of parking time they wish to buy and the fee is charged to a credit or debit card associated with the mobile phone number. A text message reminder is sent to the driver’s phone before the parking period expires so that, if needed, additional time can be purchased by phone from any location. A receipt is also sent to the user’s email account. The service also provides support for non-NFC mobile phone users. Instead of tapping their phone, they are able to access the same service by manually entering the parking meter’s eight digit identification number into the app. “This is one of the largest deployments of NFC technology in the United States and shows the practical benefits this technology can deliver in terms of ease of use and convenience,” enthuses Neil Podmore, vice president of business development at PayByPhone.